Macnas Artistic Director Noeline Kavanagh announces Halloween Parade 2018, with next generation artists, magical new inventions and an extended route. “Out of the Wild Sky” the 2018 Macnas parade will traverse through the streets of Galway at 5.30pm on Sunday October 28th, 2018. 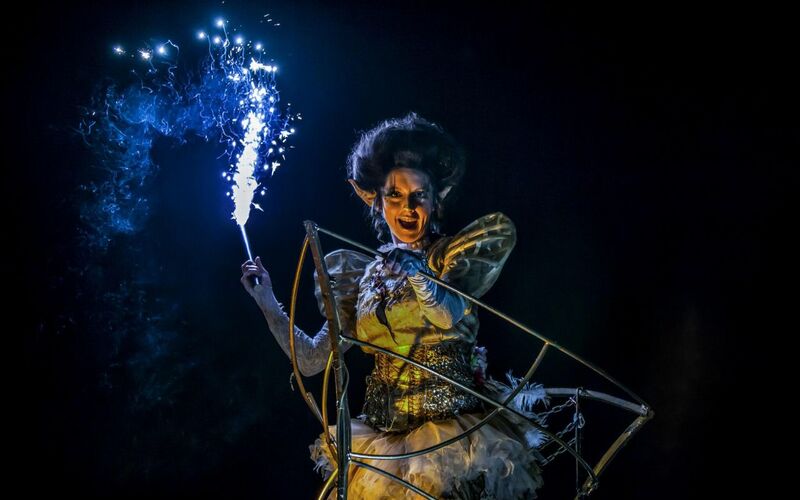 Beginning at its home on the NUI Galway campus the parade will weave it’s way through the heart of Galway, the Macnas Halloween Parade is the highlight of Ireland’s cultural calendar. It is the largest free event in In Ireland for Halloween with over 54,000 people lining the streets every year to be awed and amazed by this epic scale of storytelling. This year’s story celebrates the act of transformation being unleashed upon the city, changing into a world that is hypnotic and intoxicating, glittering, mysterious and filled with shadow and nobility. Between the white fire of the stars and the whispering woods you can hear the breath of small kingdoms rising and falling , dreams floating light as moths among the branches of the trees, where sweetness and tangibility flickers amongst the dark hug of time. Macnas bring “Out of the Wild Sky” to the streets of Galway, packed full of love and magic, as they sculpt a new cosmos into being, where the language of birds and the stars take flight, bells ring out stitches of lightning burst forth as a new horizon lights up the deep and the wondrous and lifts up the sky. Always a gigantic undertaking, this year’s parade will feature the signature Macnas giant creations and sculptural images, pyrotechnics, bespoke costumes, and epic performances to live and original music. Delivering this wondrous chaos are hundreds of performers from the Macnas Young Ensemble, Youth Ballet West, the Macnas Youth Drummers, the Public participation programme, The Hit Machine and many more. The Macnas parade includes the work of the Macnas creative ensemble, comprised of 45 professional artists and 300 volunteers directed by CEO/Artistic Director Noeline Kavanagh. The creative wizards behind this years inventions include Orla Clogher and Dave Young on design, Saileog O’Halloran on costume, Alma Kelleher on sound design, The Face on hair and Michelle Ruane is our makeup designer. Eimhin Craddock will head up the Macnas Youth Drummers and Miquel Barcelo is once again at the helm with the Young Ensemble. “We are very grateful to be supported by the Arts Council of Ireland and Galway City Council for our year long programme of creative work. We are delighted to have the support of our partners Latin Quarter who will co-present this iconic event for the sixth year in a row with Macnas. For the Halloween parade we are thrilled to have the additional support from local Galway businesses patrons: O’Connells Bar Eyre Square, Acorn Life, and Galway Clinic. This year and up to 2021 the Connacht Hospitality Group have jumped on board the Macnas train to support the Macnas Young Ensemble which is terrific,” says Noeline Kavanagh. The parade will begin at NUIG (Aula Maxima), and take to the streets along the following route: University Rd, Salmon Weir Bridge, St Vincent’s Ave, Francis St, Eglington St, William St, Shop St, Church Yard St, Mainguard St, Bridge St, O’Brien’s Bridge, Dominick St Lower, Dominick St Upper, Crossing canal, Raven’s Terrace, Claddagh Quay. For the fifth year in a row, Macnas then head to the capital on Monday October 29th and will close the Bram Stoker Festival with the hauntingly beautiful, wild and tempestuous parade on the streets of Dublin.. the last waltz with shadow as we move towards the light.. Hit the streets of Galway early to catch Macnas 2018, to find out the latest on Macnas check social media for the parade countdown or visit macnas.com for more information.